In a park lodge in West Virginia, a restaurant employee is bitten by a young raccoon near the restaurant’s pantry. The raccoon and his littermates are later trapped and killed to protect the public. Elsewhere, in Big Pine Key, Florida, an endangered female key deer casually steps onto a two-lane road to seek handouts from a young couple idling in a convertible. Further down the same road, a brown plastic sign informs drivers the number of key deer who have been struck by motorists that year. Far away in the Bob Marshall Wilderness Area in Montana, a black bear tears into a tent and mauls the man inside. The man survives, if only due to the quick response of forest service employees who heard his screams. The 185-pound male black bear is later tracked and killed. The resulting investigation reveals that the bear was not “born vicious,” but had been fed by humans to such an extent that he had learned to approach people when he felt hungry. Each of these stories is true, and many like them occur regularly throughout the United States. Though different parks and animals are involved, each story has a common component; every animal in every situation had learned to associate humans with food. With the possible exception of well-managed birdfeeders, feeding wildlife poses an extreme risk to both wildlife and humans. For this reason, we strongly feel that humans should never feed wild animals. When humans feed wildlife, they are effectively “training” animals to approach humans for food. These animals gradually lose their fear of humans to the extent that they will actually seek out campsites, garbage dumpsters, roadways, and other areas frequented by people. 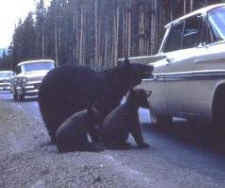 Because of the disastrous consequences, every national and state park in America prohibits the feeding of wild animals. Land managers have likewise learned that the practice of “leaving food out” to attract animals invites the same problems and have taken steps to educate the public about proper food storage. However, many humans continue to feed wildlife as if it were a harmless or even compassionate diversion. The visitor who sends a bread-wielding child toddling towards a hungry deer normally is thinking of nothing else but capturing a sweet photograph for a scrapbook. After returning home, visitors seldom learn of the consequences to the animal, the park, or even their own child who has just learned that it’s safe and fun to approach wild animals. Park employees don’t like to destroy “nuisance” animals, nor do they enjoy responding to auto-collisions and reports of wild animal attacks. Unfortunately, an animal who associates humans with food can seldom be persuaded to stop approaching humans. Likewise, persuading visitors to stop feeding wildlife can be similarly challenging. Feeding wild animals in parks may seem like fun, but there is just not a responsible or legal way to do it. Instead of using food to experience wildlife up-close, we recommend using a good set of binoculars or the zoom on your camera. Depending on where you live, you may also be able to improve the habitat value of your own yard by adding berry bushes, fruit trees, and brushy areas. In addition to adding enjoyment to your property, you will likely see more wildlife and best of all, view them from the safety of your deck!